I'm going to drink more water. I'm going to eat croissants without pretending I'm in Paris. I'm going to stop eating so many toasted almonds between meals. I'm going to start to eat proper lunches. Unless a box of Ritz crackers and a glass of cold milk are considered proper, and if so, I'll continue to eat proper lunches. I'm going to give as much thought and time to my recovery as I do to my work-out. I'm going to mulch the garden (I promise). I'm going to finish that sewing project I started a year ago. I'm going to sort my ever-expanding cook book collection into some-sort-of-order and find some-where-to-put-it. I'm going to take this Tuesday and give it a good shake. AND I'm going to conjure up a meal out of half a pumpkin and some day-old bread. I just wanted to get that off my chest. Thanks for listening. 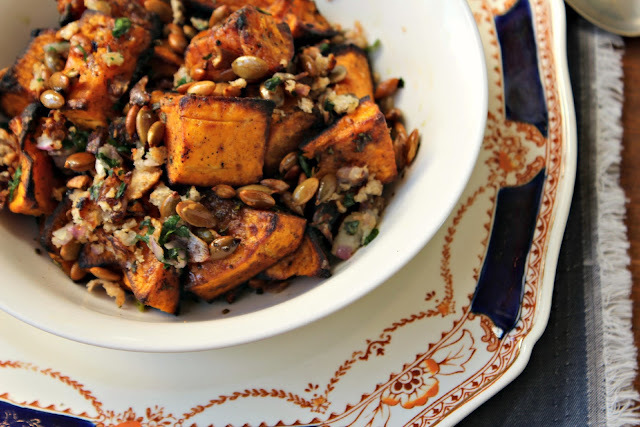 Combine the olive oil, cumin, chilli flakes and rosemary in a bowl, then add the pumpkin and toss to coat evenly. Season with salt and pepper, then transfer to a baking tray. Roast for 30-35 minutes until the pumpkin is soft when pierced with a skewer. 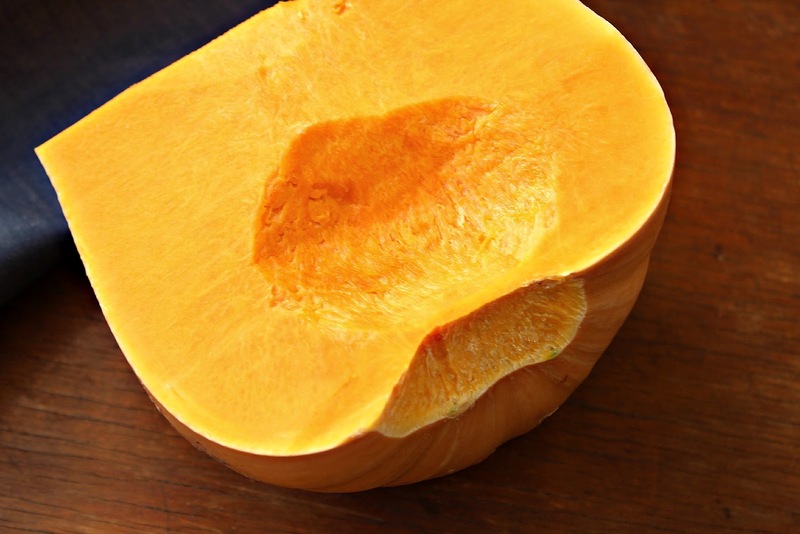 Remove from the oven and reduce the heat to 180 degrees C. Cover the pumpkin to keep it warm. 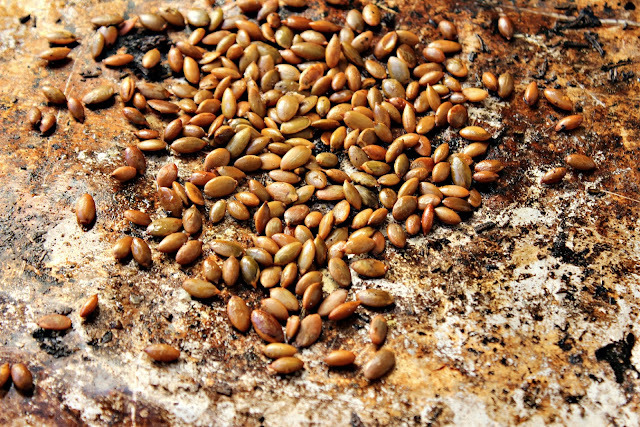 Scatter the pumpkin seeds on a baking tray, season with salt and pepper and drizzle with olive oil. Roast in the oven for 10 minutes or until golden brown. Warm the olive oil in a frying pan over medium heat. Add the shallot and cook for 5 minutes, stirring often. Tip in the breadcrumbs and herbs and fry, stirring frequently to coat with the oil. Season with salt and pepper. When the crumbs are starting to turn light brown (about 5-10 minutes), remove from the heat. 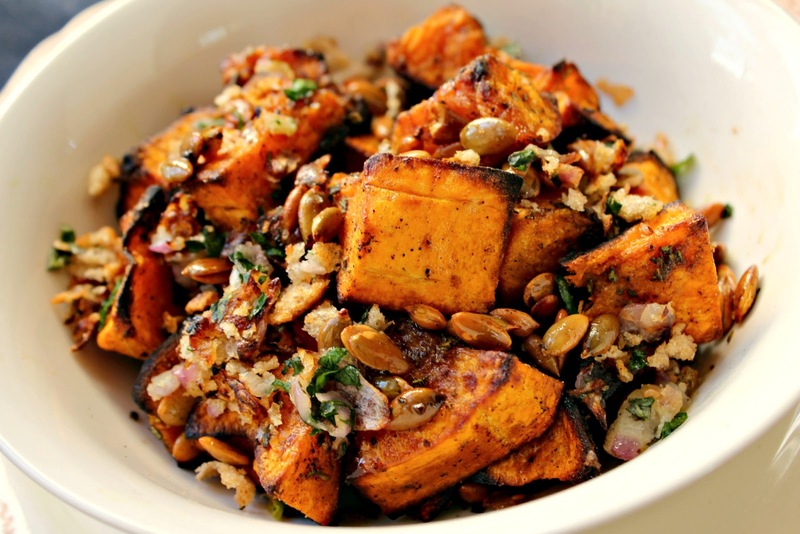 Place the roasted pumpkin in a large serving bowl and scatter with the roasted pumpkin seeds and pangrattato. Oh, how lovely this is! 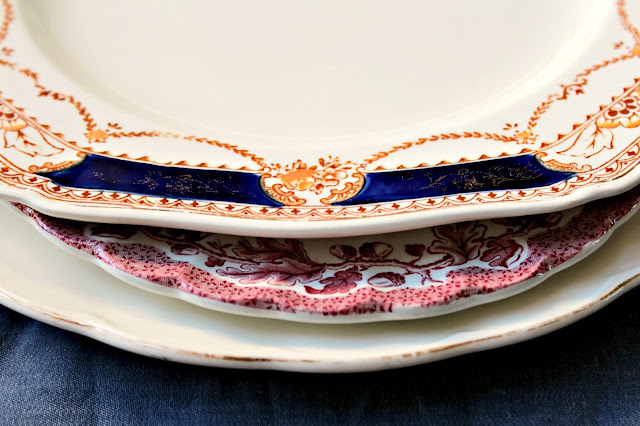 You know, I love those beautiful dinner plates! Looks like the perfect “beginning to be chilly weather” meal. 2 beautiful large butternut squash have just found their way into my possession, I wonder if it would work as well with them? Then maybe I could have a pumpkin latte' for dessert:) . Have you picked out the perfect wedge for your upcoming warm weather? 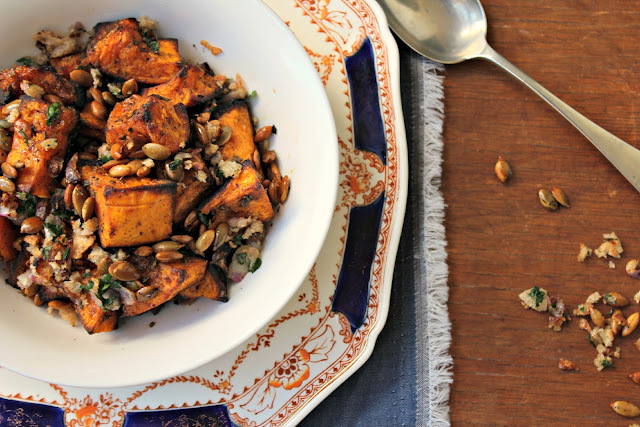 I have a ton of leftover pumpkin chunks -- thank you for the recipe idea for tonight's dinner!! I never heard a word about not having a latte, so you are good to go! Your secret is safe:). Good luck with the summer shopping, I just acquired the perfect patent peep-toe.. They are now my favorite, for the moment anyway.. I'm putting together a recipe roundup of pumpkin seed recipes for HuffPost Taste and we're interested in featuring this recipe. Can we have permission to use your photo? We'll link back with credit to your blog. Hey Joseph. I'm more than happy for you to use my photo in your roundup. Thanks for asking. If you use Butternut squash (I bought one today at a farm stand), can you use the seeds the same way as from a pumpkin? Hey Over 50 Health... Absolutely. You can use butternut squash seeds exactly the same way. Enjoy.